St. Bernard Parish (French: Paroisse de Saint-Bernard; Spanish: Parroquia de San Bernardo) is a parish located in the U.S. state of Louisiana. As of the 2010 census, the population was 35,897. The parish seat and largest community is Chalmette. 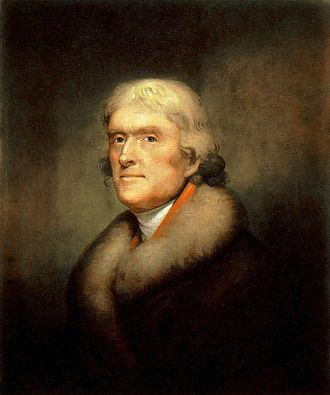 The parish was formed in 1807. St. Bernard Parish is part of the New Orleans–Metairie, LA Metropolitan Statistical Area. 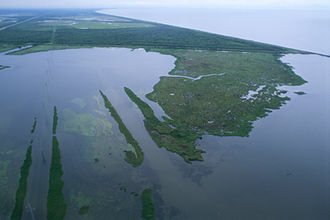 The parish is located southeast of New Orleans and comprises the Chandeleur Islands and Chandeleur Sound in the east. It has been ranked the fastest-growing county (parish) in the United States from 2007 to 2008 by the U.S. Census Bureau, but it is only half as populated as it was in 2005. In 2009, because of evacuation and emigration due to destruction by Hurricane Katrina, its population was estimated to be 33,439. Kenilworth Plantation House (originally Bienvenu) in St. Bernard's Terre aux Boeufs dates back to the 1750s. St. Bernard Parish contains a large community of Spanish descent. Sometimes referred to informally as "Spanish Cajuns", the Isleños are descended from Canary Islanders. This linguistically isolated group eventually developed its own dialect. The Isleños settled along Bayou Terre aux Boeufs, a relict distributary bayou of the Mississippi River. 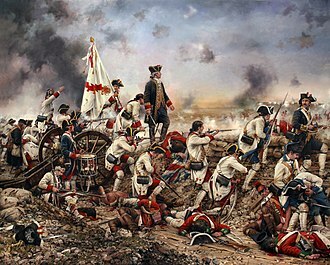 According to Dumont de Montigny, who was in Louisiana from 1719 to 1738, Terre aux Boeufs ("boeuf" = "steer" or "ox" in French, "Terre aux Boeufs" = "land of oxen" ) was named in that period, presumably due to the presence of domestic or feral cattle there, and not because of bison ("bison" in French). This settlement was called La Concepcion and Nueva Gálvez by Spanish officials, but was also called Tierra de Bueyes (Spanish) for "land of oxen." Saint Bernard, the patron saint of colonial governor Bernardo de Gálvez, was used in documents to identify the area. St. Bernard Parish is also home to the earliest Filipino community in the United States, Saint Malo, Louisiana. 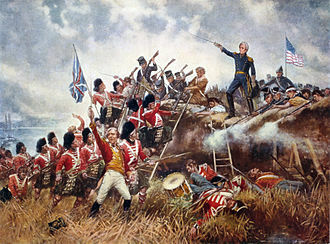 The chief historical attraction in St. Bernard Parish is the Chalmette National Historical Park (or Chalmette Battlefield), at which the Battle of New Orleans took place on January 8, 1815, during the War of 1812. Many street names near the battlefield bear the names of the chief participants, or take a pirate theme, since the pirate Jean Lafitte was considered to be a hero in the battle. 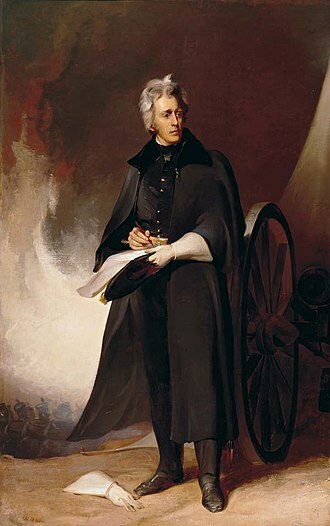 A high school, later elementary and now a middle school, was named in honor of Andrew Jackson, who was the commanding officer in charge of defending New Orleans against the British invasion. 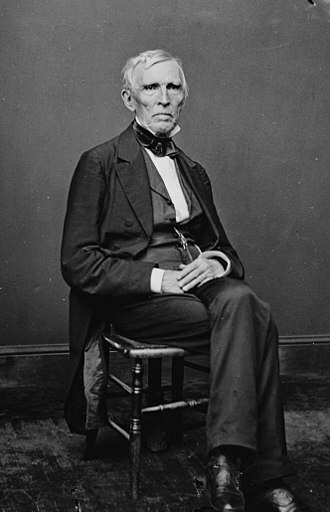 In 1863, Abraham Lincoln mentioned St. Bernard Parish in the Emancipation Proclamation as an area not in rebellion against the Union during the Civil War. 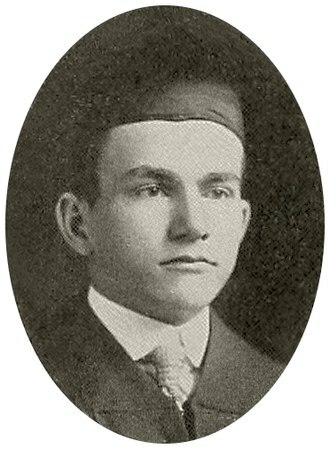 From 1919 to 1969, the parish was effectively ruled as part of the fiefdom of Leander Perez, a local Democratic official in neighboring Plaquemines Parish. In 1868, St. Bernard Parish was home to one of the deadliest massacres in Louisiana history. 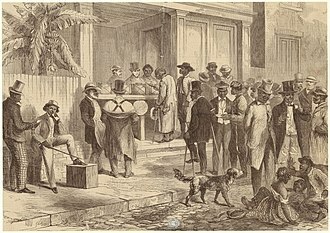 The St. Bernard Parish massacre occurred during the Reconstruction era, days before the Presidential election of 1868. As black men gained the right to vote, white Democrats of the parish feared losing their majority. Armed groups mobilized to violently silence these recently emancipated voters to win the election in favor of Democrat Horatio Seymour over Republican Ulysses S. Grant. 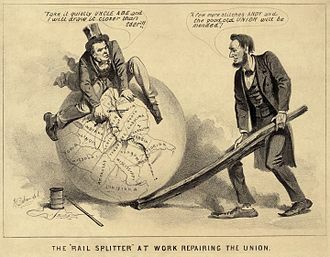 A Seymour victory meant the end of Reconstruction over the South and the return of Louisiana to home rule. Many freedmen were dragged from their homes and murdered. Others fled to the cane fields to hide from the perpetrators. The use of violence to suppress Republican votes was successful. Grant only received one vote from St. Bernard Parish, despite having a Republican majority. The reported number of freedmen killed varies from 35 to 135; the number of whites killed was two (one was killed in an attempt to help the victims). An Army Corps Photo of the levee at Caernarvon being dynamited during the floods of 1927. 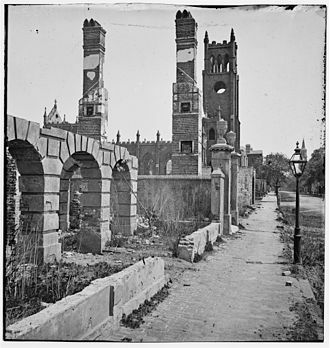 During the Great Mississippi Flood of 1927, New Orleans city and state leaders used dynamite to breach a levee at Caernarvon, thirteen miles (19 km) below Canal Street, to save the city of New Orleans from flooding. 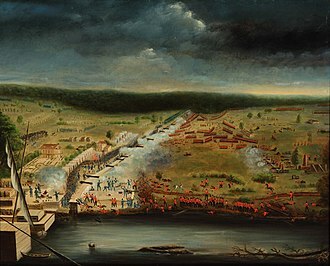 At the time, it was thought by New Orleans residents that the dynamiting saved the city, but historians now believe that the dynamiting was unnecessary due to major upstream levee breaks that relieved pressure on the New Orleans levees. The levee breach caused flooding and widespread destruction in most of Eastern St. Bernard Parish and parts of Plaquemines Parish. Residents were never adequately compensated for their losses. 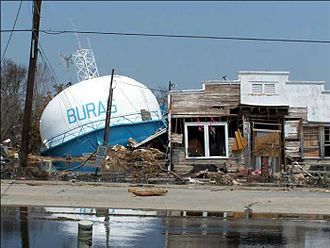 On August 29, 2005, St. Bernard was devastated by Hurricane Katrina. 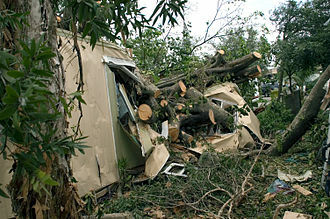 The storm damaged virtually every structure in the parish. 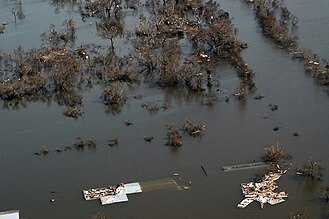 The eye of Katrina passed over the eastern portion of the parish, pushing a 25-foot (7.6 m) storm surge into the Mississippi River Gulf Outlet ("MRGO"). 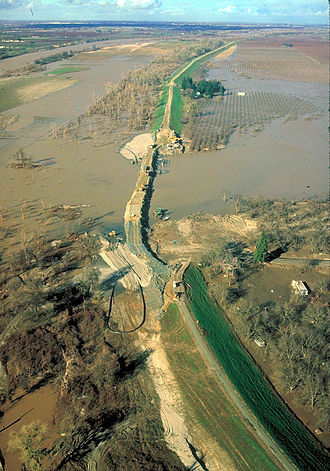 This surge destroyed the parish levees. Almost the entire parish was flooded, with most areas left with between 5 and 15 feet (4.6 m) of standing water. The water rose suddenly and violently, during a period which witnesses reported as no more than fifteen minutes. In many areas, houses were smashed or washed off their foundations by a storm surge higher than the roofs. "Involuntary Demolition" notice, posted on buildings in St. Bernard Parish when there has been no significant effort to gut, secure, or repair the building over a year after Hurricane Katrina. As of late November 2005, it was estimated that the Parish had some 7,000 full-time residents, with some 20,000 commuting to spend the day working, cleaning up, or salvaging in the parish and spending their nights elsewhere. By mid-December some businesses had returned to the Parish, most notably the ExxonMobil plant in Chalmette and the Domino Sugar plant in Arabi, together with a handful of small local stores and businesses. 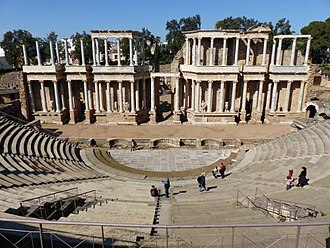 At the start of January 2006, it was estimated that some 8,000 people were living in the Parish. The H.O.P.E. Project, a collective of volunteer relief workers, founded itself in January 2006 in the empty shell of the Corinne Missionary Baptist Church in Violet, LA, providing the tools for rebuilding and community empowerment. Since June 2006, Camp Hope, located in Arabi, has been housing volunteers' assisting residents of St. Bernard Parish in their recovery from Hurricane Katrina. A grassroots organization, the St. Bernard Project, opened its doors in March 2006. A fully volunteer-run organization funded by the United Way, they help residents get back into their homes by working on the houses, providing tools, support and where possible, funding. As of October 2006, the population was estimated to be 25,489 After population losses due to Hurricane Katrina, the school was reopened for elementary grades for the 2006-2007 school year. According to the U.S. Census Bureau, the parish has a total area of 2,158 square miles (5,590 km2), of which 378 square miles (980 km2) is land and 1,781 square miles (4,610 km2) (83%) is water. It is the second largest parish in Louisiana by total area and has the largest percentage of area in water of any parish. The parish of St. Bernard embraces numerous small islands. The parish is classed among the alluvial lands of the state. The ridges comprise the arable lands of the parish and have an area of 37,000 acres (150 km²). The principal streams are the Bayous Terre aux Boeufs and La Loutre. There are numerous smaller streams which are efficient drainage canals. 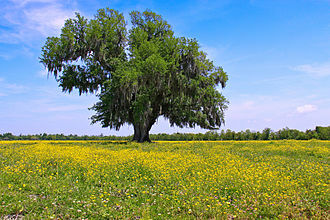 The dominant tree species is bald cypress, of which the most valuable trees have been cut and processed. As of the census of 2000, there were 67,229 people (an increase of 598 or 0.9% over the previous decade), 25,123 households, and 18,289 families residing in the parish. The population density was 145 people per square mile (56/km²). There were 26,790 housing units at an average density of 58 per square mile (22/km²). The racial makeup of the parish was 88.29% White, 7.62% Black or African American, 0.49% Native American, 1.32% Asian, 0.02% Pacific Islander, 0.73% from other races, and 1.52% from two or more races. 5.09% of the population were Hispanic or Latino of any race. There were 25,123 households out of which 33.70% had children under the age of 18 living with them, 53.40% were married couples living together, 14.60% had a female householder with no husband present, and 27.20% were non-families. 22.90% of all households were made up of individuals and 10.10% had someone living alone who was 65 years of age or older. 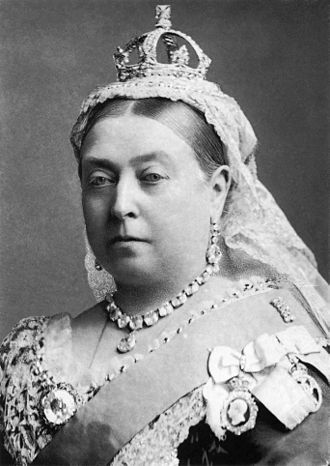 The average household size was 2.64 and the average family size was 3.12. In the parish the population was spread out with 25.20% under the age of 18, 9.20% from 18 to 24, 29.20% from 25 to 44, 22.60% from 45 to 64, and 13.80% who were 65 years of age or older. The median age was 37 years. For every 100 females there were 93.60 males. For every 100 females age 18 and over, there were 90.10 males. The median income for a household in the parish was $35,939, and the median income for a family was $42,785. Males had a median income of $34,303 versus $24,009 for females. The per capita income for the parish was $16,718. About 10.50% of families and 13.10% of the population were below the poverty line, including 16.50% of those under age 18 and 11.40% of those age 65 or over. As of the census of 2010, there are 35,897 people. The racial makeup of the parish was 26,579 whites, 6,350 blacks, 690 Asians, 260 Native American, and the rest of any other race. Between the 2000 U.S. Census and the 2010 U.S. Census the Hispanic population of St. Bernard Parish increased. As of 2011 9% of the parish population is Hispanic. Public schools in the parish are operated by the St. Bernard Parish Public Schools agency. Due to Hurricane Katrina, the parish's 20 plus public schools were consolidated as one school, the St. Bernard Unified School, or SBUS. St. Bernard Unified School broke up into several different schools in the 2006-2007 school year. The parish is served by Nunez Community College. As of 2011, the Public School System has expanded. Andrew Jackson High School was converted into a Middle School. Lacoste Elementary has been converted into a Ninth Grade Academy. Trist Middle School is once again serving as a Middle School. At the start of the 2016-2017 school year there was one high school, Chalmette High school and Chalmette High Ninth Grade Academy (old Lacoste Elementary). There were three middle schools, Andrew Jackson Middle (old Andrew Jackson High), St Bernard Middle School (old St. Bernard High), and N. P. Trist Middle. Six elementary schools service the parish: Arabi Elementary, Chalmette Elementary(old Chalmette Middle), Joseph Davies Elementary, J. F. Gauthier Elementary (new building, the old Gauthier is close due to mold), Lacoste Elementary (old St. Mark's Catholic School)and William Smith Elementary. There is also C. F. Rowley Alternative School. St. Bernard Parish also has only one Catholic school, Our Lady of Prompt Succor. There is also one Christian school, Classique Academy. While St. Bernard is served mainly by New Orleans media sources, such as a local section of The Times-Picayune, the Parish does have multiple newspapers. The St. Bernard Voice, established in 1890, serves as the official journal of the parish. The St. Bernard News was established in 1967 and publishes weekly. Formerly published newspapers that served the parish include the St. Bernard Eagle and the St. Bernard Weekly Eagle which published in the 1870s through 1884 in Arabi, Progress which published from Stock Landing (Arabi) in 1888-1889, St. Bernard Protector 1925-1926, and the St. Bernard Guide which published from 1982-1986. There are no incorporated areas in St. Bernard Parish. ^ "St. Bernard Parish". Center for Cultural and Eco-Tourism. Retrieved September 6, 2014. ^ "3 parishes' population estimates go way up in Census recalculation". January 15, 2009 article by The Times-Picayune. Retrieved 2009-01-15. ^ "National Capital Regional Office (U.S. National Park Service)". www.nps.gov. Retrieved 2018-02-16. ^ Dier, C.. The 1868 St. Bernard Parish Massacre: Blood in the Cane Fields. Charleston, SC: The History Press. ISBN 9781625858559. ^ Barry, John M. Rising Tide: The Great Mississippi Flood of 1927 and How It Changed America (1998 paperback ed.). New York: Touchstone Books. pp. 253–258. ISBN 0-684-84002-2. ^ "New Orleans population still cut by more than half". 29 November 2006 article by Reuters. Retrieved 2006-12-06. ^ Hernandez, Monica. "Census shows growing Hispanic population in Jefferson Parish." (Archive) WWL-TV. 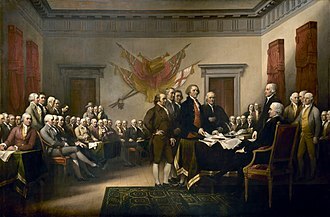 February 4, 2011. Updated Saturday February 5, 2011. Retrieved on March 22, 2013. ^ Louisiana State University Libraries Special Collections. "Louisiana Newspaper Project". Archived from the original on 2010-02-04. Retrieved 2012-05-30. ^ Leip, David. "Dave Leip's Atlas of U.S. Presidential Elections". uselectionatlas.org. Retrieved 2018-02-16. Wikimedia Commons has media related to Saint Bernard Parish, Louisiana. As of the April 1,2012, the metropolitan statistical area had a population of 1,227,096. The New Orleans-Metairie-Hammond Combined Statistical Area, an area, had a population of 1,452,502. 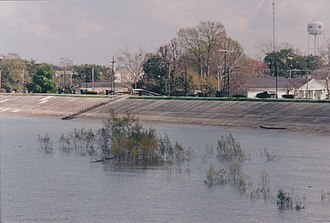 The metropolitan area was hit by Hurricane Katrina – once a Category 5 hurricane, within the city of New Orleans proper, multiple breaches and structural failures occurred in the system of levees and flood walls designed under Federal government auspices. The resulting decline in the population negatively impacted population numbers for the entire metro area. The New Orleans–Metairie–Bogalusa Combined Statistical Area is made up of nine parishes, the CSA includes two metropolitan area and one micropolitan areas. The Census Bureaus CSA adds Washington and Tangipahoa Parishes, to make nine parishes, the New Orleans regions chamber of commerce, GNO, Inc. includes the nine parishes of the Census Bureaus CSA plus St. James Parish. This wider 10-parish region had a population of 1.32 million as of July 1,2008, the Louisiana state legislature created a commission, the Regional Planning Commission, to be responsible for the planning and development of the New Orleans metropolitan area. The five parishes covered by the commission are, Orleans, Plaquemines, St. Bernard, additionally, St. Charles and St. John the Baptist are associate members of the Regional Planning Commission. The New Orleans metropolitan area was first defined in 1950, known as the New Orleans Standard Metropolitan Area, it consisted of three parishes – Orleans, and St. Bernard – and had a population of 685,405. Following a term change by the Bureau of the Budget, the New Orleans SMA was called the New Orleans Standard Metropolitan Statistical Area, by the census of 1960, the population had grown to 868,480, a 27% increase over the previous census. St. Tammany Parish was added the New Orleans SMSA in 1963, the four-parish area had a combined population of 899,123 in 1960 and 1,045,809 in 1970. By the 1980 census, the population had increased by 14% to 1,187,073, in 1983, the official name was shortened to the New Orleans Metropolitan Statistical Area. Two more parishes, St. Charles and St. John the Baptist, were added to the MSA the same year, making a six-parish MSA. Leander Henry Perez, Sr. was the Democratic political boss of Plaquemines and St. Bernard parishes in southeastern Louisiana during the middle third of the 20th century. 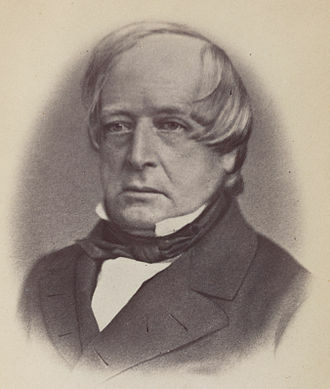 Officially, he served as a judge, as district attorney. He was known for enforcing and preserving segregation, Perez was born in the small town of Dalcour, on the east bank of Plaquemines Parish, to Roselius E. Fice Perez and the former Gertrude Solis. The Perez and Solis families were Isleño American, a community descended from settlers from the Canary Islands. 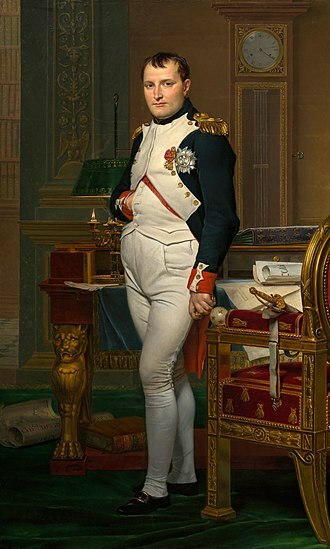 Perez was educated in New Orleans schools, Louisiana State University at Baton Rouge, Perez opened a law practice in New Orleans and in Plaquemines Parish. In 1916, Perez was defeated as a candidate from Plaquemines Parish for state representative, in 1919, he was appointed judge of the 29th Judicial District to fill an unexpired term. In 1920, he won a term as judge by defeating the candidate of a local political machine run by his intra-party rival John Dymond. Perez was elected district attorney in 1924 and became involved in a dispute over trapping lands and he served as district attorney until 1960, never earning more than $7,000 a year. 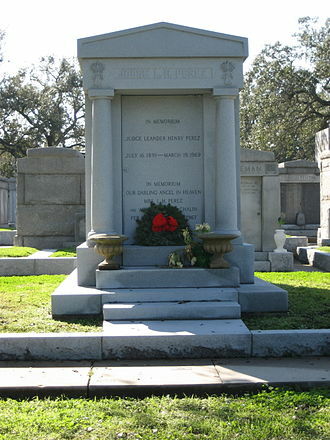 In 1928, Perez allied with Huey Pierce Long, Jr. who was elected governor, in 1929, he successfully defended Long in the latters impeachment trial before the Louisiana State Senate. Perez became wealthy by subleasing state mineral lands, in 1940, the state Crime Commission investigated Perez at the request of Governor Sam Houston Jones. In 1943, Jones sent state troopers to Plaquemines Parish to enforce his appointment of an anti-Perez parish sheriff and Jones both came out of the conservative wing of the Democratic Party, but whereas Perez had been a Huey Long backer, Jones was staunchly anti-Long. In 1919, Judge Perez launched a reign of bought elections, laws were enacted on Perezs fiat and were rubber-stamped by the parish governing councils. Perez-endorsed candidates often won with 90% or more of the ballots and those who appeared to vote were intimidated by Perezs enforcers. He sent large tough men into the voting booths to help people vote, Perez testified that he bribed voters $2, $5, and $10 to vote his way, depending on who they were. Metairie is a census-designated place in Jefferson Parish, United States and is a major part of the New Orleans Metropolitan Area. Metairie is the largest community in Jefferson Parish and the fifth-largest CDP in the United States and it is an unincorporated area that would be Louisianas fourth-largest city if it were incorporated. The zip codes that serve the community are 70001-70006, métairie is the French term for a small tenant farm which paid the landlord with a share of the produce, known as sharecropping. 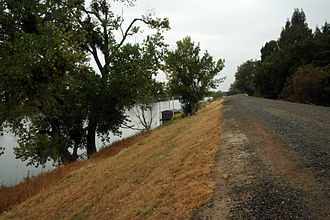 In the 1760s, many of the original French farmers were tenants, after the US Civil War, the Acolapissa Native Americans used this ridge as a road, and it is the oldest road in the New Orleans area. Paved in the 1920s, it is called Metairie Road, an electric streetcar was installed running along Metairie Road in the late 1910s, opening the area to greater development. Upscale housing tracts were constructed off the road in the 1920s and it is today the most prestigious area of Metairie. The areas to the north and northwest of Metairie Road were not developed until after World War II, the land between Metairie Ridge and Lake Pontchartrain, which was cypress swamps and marshlands, was drained with the Wood Pump. With development of new land for residences, Metairies population grew in the 1940s as a result of cheaper land, lower taxes. In 1990, Metairie made history when one of its districts elected white supremacist David Duke to the Louisiana state legislature for a single term. In 2005, Hurricane Katrina caused a new migration from Orleans Parish and it has been a racially neutral migration, with equal numbers of black and white residents moving to Jefferson Parish. The 2010 Census showed that Metairie has increasingly become more diverse, Veterans Boulevard was laid out alongside a drainage canal, and became a commercial center of the region. The Central Business District of Metairie is located on Causeway Blvd near Lake Pontchartrain, Metairie has one of the handful of major malls located in the New Orleans metro area. 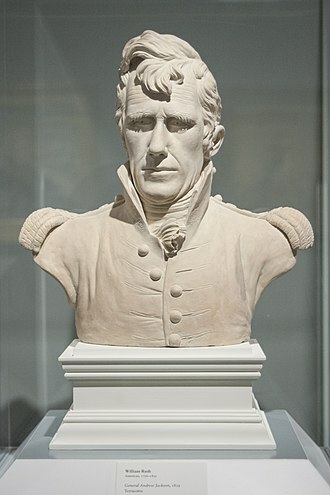 Louisianas 1st congressional district is a congressional district in the U. S. state of Louisiana. The district comprises land from the shore of Lake Pontchartrain south to the Mississippi River delta. The district is represented by Republican Steve Scalise. Prior to 1974, the 1st Congressional District was entirely south of Lake Pontchartrain, the 1st Congressional District acquired Tangipahoa and Washington parishes, both north of the lake, from the 6th Congressional District. Correspondingly, the 1st Congressional District shed conservative St. Bernard Parish, the 1st Congressional District has become a very safe district for the Republican Party. Before the 1960s, it was controlled by Democrats, but conservative whites realigned with the Republican Party, the seat was held by former Governor Bobby Jindal. Republicans have held the seat since 1977 and that year Bob Livingston won a special election after Richard Alvin Tonry, who won the seat in 1976, was forced to resign the seat and lost the Democratic primary in the special election. A geodesic dome is a hemispherical thin-shell structure based on a geodesic polyhedron. The triangular elements of the dome are structurally rigid and distribute the stress throughout the structure. A first, small dome was patented, constructed by the firm of Dykerhoff and Wydmann on the roof of the Zeiss plant in Jena, a larger dome, called The Wonder of Jena opened to the public in July 1926. Some 20 years later, R. Buckminster Fuller named the dome geodesic from field experiments with artist Kenneth Snelson at Black Mountain College in 1948 and 1949. Although Fuller was not the inventor, he is credited with the U. S. popularization of the idea for which he received U. S. patent 2,682,23529 June 1954. Howard of Synergetics, Inc. and specialty buildings like the Kaiser Aluminum domes, weather observatories, the dome was soon breaking records for covered surface, enclosed volume, and construction speed. Marines experimented with helicopter-deliverable geodesic domes, a 30-foot wood and plastic geodesic dome was lifted and carried by helicopter at 50 knots without damage, leading to the manufacture of a standard magnesium dome by Magnesium Products of Milwaukee. The dome was introduced to an audience as a pavilion for the 1964 Worlds Fair in New York City designed by Thomas C. Howard of Synergetics. This dome is now used as an aviary by the Queens Zoo in Flushing Meadows Corona Park after it was redesigned by TC Howard of Synergetics, another dome is from Expo 67 at the Montreal Worlds Fair, where it was part of the American Pavilion. The structures covering burned, but the structure still stands and, under the name Biosphère. In the 1970s, Zomeworks licensed plans for structures based on other geometric solids, such as the Johnson solids, Archimedean solids and these structures may have some faces that are not triangular, being squares or other polygons. In 1975, a dome was constructed at the South Pole, on October 1,1982, one of the most famous geodesic domes, Spaceship Earth at the EPCOT Center in Walt Disney World, opened. The building is Epcots icon, and is included in the parks logo. In the year 2000 the worlds first fully sustainable geodesic dome hotel, the hotels dome design is key to resisting the regions strong winds and is based on the dwellings of the indigenous Kaweskar people. Chalmette Battlefield, with house and monument along the Mississippi River. Hurricane Katrina: cars in Chalmette, post-hurricane. 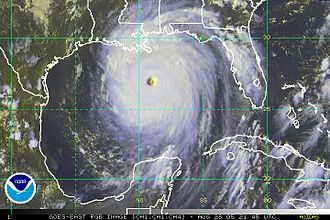 Katrina on August 28, nearing the Gulf Coast. 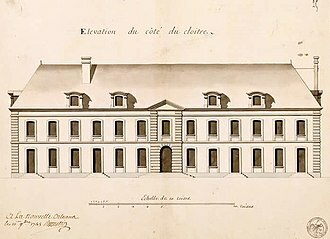 A 1745 elevation by Broutin of the Ursuline Convent in New Orleans. "Lincoln Speaks to Freedmen on the Steps of the Capital at Richmond"
Inscription on house in storm-surge devastated neighborhood of Chalmette, Louisiana suggests that the ruins be used to fill MRGO. 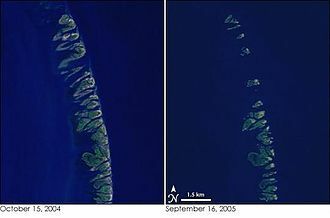 The left image is from before Hurricane Katrina and the right is from after, showing the reduction of the islands and exposure of the Sound to the Gulf. 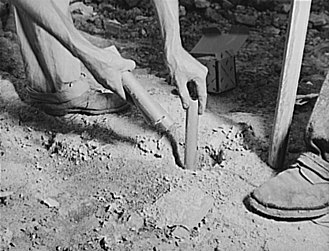 Preparation of dynamite during the construction of the Douglas Dam, 1942. 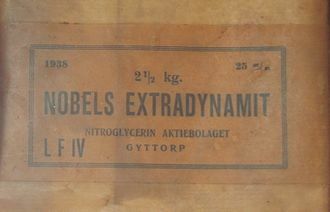 Advertisement for the Aetna Explosives Company of New York.